Before I get to the regular show picks, I must indulge in a moment of shameless self-promotion. 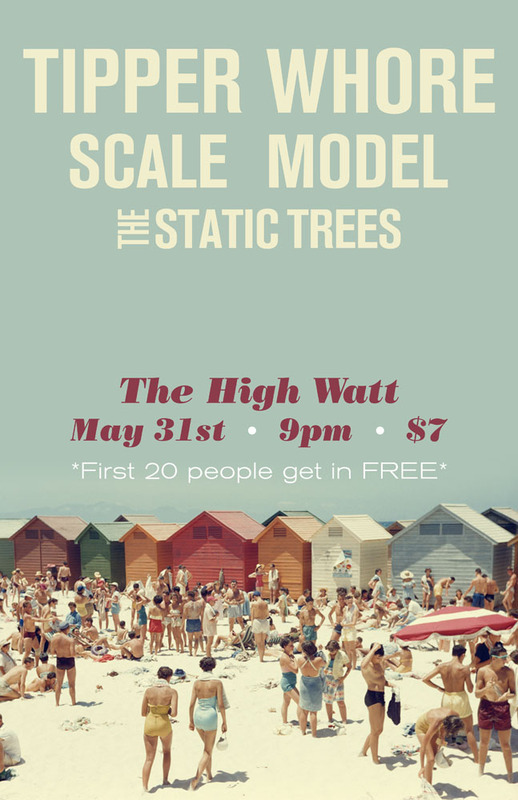 As you probably know, I’m in a band called Scale Model. We have an exciting show tonight at the High Watt and I strongly encourage you to come check it out! We’re playing with our friends Tipper Whore, who have been taking Nashville by storm recently, and The Static Trees, who we saw blow the roof off a house show in Murfreesboro a few months ago. This is a really solid lineup, and we’re gonna be debuting a few new songs, so if you’ve seen us recently that’s no excuse! Arrive early because the first 20 people get in for FREE! That’s it, have a great weekend! I always spent mmy half an hour too read this website’s articles everyday along with a cup of coffee. « Summer rock camps are right around the corner, and need your help!